Black speargrass (Heteropogon contortus) is a widespread, native perennial grass which is distributed throughout much of eastern Queensland particularly in areas receiving between 600mm and 1,000mm annual rainfall. Before European settlement, much of the now black speargrass area was dominated by kangaroo grass (Themeda triandra). 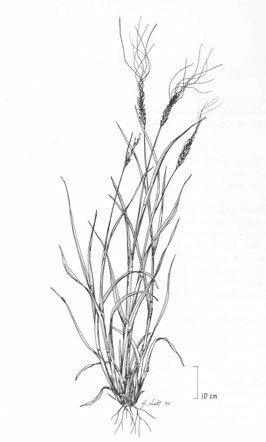 Kangaroo grass declined substantially because it was intolerant of grazing and was replaced by black speargrass. There is evidence that black speargrass is now in decline throughout much of Queensland. This happens when stocking rates increase to levels too high for black speargrass to remain dominant. In northern Queensland, extensive areas that were once dominated by black speargrass are now dominated by inferior grasses such as Indian couch (Bothriochloa pertusa). Black speargrass grows on a wide variety of soil types. It grows best on coarse textured soils and does not grow well on clay soils. Black speargrass is a summer growing perennial grass. It usually starts growing with storms in spring and continues throughout summer until early April, depending on rainfall. Growth occurs from small tiller buds located at the base of existing tussocks. Although most of these new tillers (or stems) emerge in spring some new tillers do emerge later in the summer. During summer, these tillers keep becoming taller until about March when some tillers flower and produce seed. By late April when the tussocks have finished seeding the characteristic ‘bunches’ of seeds become prominent. At this stage, the seeds are dormant and they eventually fall to the ground. Dormancy is usually overcome by the increasing soil temperatures with increasing daytime temperatures during spring. Most black speargrass tussocks live for around five years although one recent study found some tussocks survived for 15 years. This five year average life span means that regular seedling recruitment is necessary to maintain plant density. Seedlings usually appear after the first spring/early summer storms. The number of seedlings usually depends on how much seed is set in the previous autumn. Seedling recruitment is substantially boosted by burning within a few days of receiving the first rainfall event of 20mm or so. Black speargrass responds well to moderate grazing pressure. However, where grazing pressure is consistently too high over a number of years the death rate of existing tussocks exceeds seedling recruitment so that the black speargrass population is reduced. Resting over the summer growing season is very beneficial to black speargrass as the tussocks can rejuvenate. Resting over autumn maximises seed set. You can rehabilitate pastures with low black speargrass density by careful management. Rest pastures over autumn to maximise seed production, burn in spring following the first 20 mm storm to maximise seedling recruitment and then rest again over the summer. Line drawings from ‘The Grasses of Southern Queensland’ by J.C. Tothill and J.B. Hacker (1983). David Orr, formerly Queensland Government.